If you no longer wish to receive the Community Newsletter or you would like to start receiving the newsletters please e-mail. You may forward this e-mail to friends and family who would be interested in attending the meeting and/or interested in receiving future newsletters. The next meeting of the Mims Community Group will be on April 16, 2019 at 6:00pm at the Moore Cultural Complex (2180 Freedom Ave., Mims, FL.). Our first speaker this month will be Kathleen Roath-Algera, Founder of Food & More. Food & More is a food support group for underserved children in North Brevard, Florida. Currently providing weekend food support for underserved students in transit at Madison Middle School and expanding the food pantry at Mims Elementary. Our second speaker will be Andrea Bolitho, Recycling Coordinator for Brevard County Solid Waste Department. She will provide us an update on recycling and discuss how we can make our recycling efforts more productive. Bring your questions about recycling to this meeting. Please plan to attend this important and interesting meeting. The next meeting of the Mims Community Group will be on March 19, 2019 at 6:00pm at the Moore Cultural Complex (2180 Freedom Ave., Mims, FL.). Our speaker this month will be Mark Crosley, Executive Director of Florida Inland Navigation District. Mark spoke to our group back in January, 2017. He will provide an update on the planned dredging of the Intracoastal Waterway. This update will include when construction activity might begin at the two Dredged Material Management Areas that are located in North Brevard and when the actual dredging of the Waterway might occur. Also, he will address the concern of possible toxic substances in the dredged material and disposal of that material. He plans to bring engineering support staff to answer technical questions that you might have. Please plan to attend this important and interesting meeting. The next meeting of the Mims Community Group will be on February 19, 2019 at 6:00pm at the Moore Cultural Complex (2180 Freedom Ave., Mims, FL.). Since our legislators are busy preparing for the 2019 Session, I will give a presentation on the legislature. It will include the people who represents North Brevard, how to contact them, what bills are they sponsoring, what committees are they on, as well as a few other notable bills being considered this year. Please plan to attend this important and (I hope) interesting meeting. I will also provide an update on a couple of development activities in North Brevard. For those of you who were able to attend this month's meet, thank you. For those who couldn't attend, this synopsis should let you know what you missed. We were pleased to have Matt Culver from Brevard County Natural Resources Department as our speaker. In his excellent slide show presentation, he explained the importance of the dredging of the Indian River Lagoon and the need for septic tank rules changes. Just a reminder that there will not be a meeting of the Mims Community Group in December. The next meeting will be on January 15, 2019 at 6:00pm at the Moore Cultural Complex (2180 Freedom Ave., Mims, FL.). The next meeting of the Mims Community Group will be on November 20, 2018 at 6:00pm at the Moore Cultural Complex (2180 Freedom Ave., Mims, FL.). Our speaker for this meeting will be Corporal Pam Hibbs from the Brevard County Sheriff's Office. She will talk on personal security and security on the Rail Trail. Plan to attend this important and interesting meeting. Also, we haven't elected a President of our group for a while. So, let's do that at this meeting. If anyone would like to be President of the Mims Community Group, please attend and put your name in the hat. The Friends of the Mims/Scottsmoor Library are having a book and bake sale at the library beginning Wednesday, October 24 through Friday, October 26. The books are categorized, and the fiction areas are also alphabetized, so that you can easily find your favorite authors. The baked goods are home-made by some of the best cooks in the county. Please stop by the library and help the Friends with their fundraising. All proceeds support the Mims/Scottsmoor Library. The hours for the sale are: Wednesday, 9:00am to 5:00pm; Thursday, 12noon to 8:00pm; and Friday, 9:00am to 5:00pm. The library is located one block off US1 at 3615 Lionel Road, Mims, next to Pinewood Elementary School. The next meeting of the Mims Community Group will be on October 16, 2018 at 6:00pm at the Moore Cultural Complex (2180 Freedom Ave., Mims, FL.). Our speakers for this meeting will be Rene Plasencia and Misty Belford. Rene Plasencia is our current representative in the Florida House (District 50) and is running to be re-elected to that position. Misty Belford is currently serving on the Brevard County School Board and is running to be re-elected to that position. Plan to attend this important and interesting meeting. If you are concerned about who will be carrying guns in our schools to protect our children, Misty would be a person to ask. If you are concerned about home rule, Rene can explain why the state legislature wants a tax cut that cuts our county commissions taxes (Constitutional Amendment #1). There will be no meeting of the Mims Community Group in September. Two speakers have had to cancel and I have not been able to get another speaker. The next meeting of the Mims Community Group will be on October 16, 2018 at 6:00pm at the Moore Cultural Complex (2180 Freedom Ave., Mims, FL.). Plan to attend this important and interesting meeting. There will be no meeting of the Mims Community Group in August. I have not been able to get a speaker. The next meeting of the Mims Community Group will be on September 18, 2018 at 6:00pm at the Moore Cultural Complex (2180 Freedom Ave., Mims, FL.). Plan to attend this important and interesting meeting. The Mims/Scottsmoor Library reconstruction is complete. The furniture and boxes of books from the storage facility have been moved into the new library. They are being put in place. The Grand Re-Opening is scheduled July 28, 2018 between 10am and 2pm. There will be a short ceremony to celebrate the re-opening and to explore the new, permanent building. You are invited to attend. The next meeting of the Mims Community Group will be on July 17, 2018 at 6:00pm at the Moore Cultural Complex (2180 Freedom Ave., Mims, FL.). For this meeting I will present the proposed amendments to the Florida Constitution to be voted on this fall. There are 13 "amendments' being proposed. However, there are actually 25 disparate changes to the constitution. Because some amendments contain multiple disparate changes, you don't want to be tricked into voting for a change that you don't really want. It is important that voters understand the impact that these changes will create. Plan to attend this important and interesting meeting. The next meeting of the Mims Community Group will be on June 19, 2018 at 6:00pm at the Moore Cultural Complex (2180 Freedom Ave., Mims, FL.). Our speaker for this meeting will be Luis Hernandez from Brevard County Emergency Management. He will discuss hurricane preparedness, emergency shelter locations, tips for how to survive a hurricane event, whether to hunker down or evacuate, and methods to get hurricane information. If you have new neighbors, please be sure to invite them to this meeting. Plan to attend this important and interesting meeting. The next meeting of the Mims Community Group will be on May 15, 2018 at 6:00pm at the Moore Cultural Complex (2180 Freedom Ave., Mims, FL.). Our speaker for this meeting will Kathleen Roath-Algera from "Food & More," a new volunteer organization focused on feeding children. Their pilot project is Mims Elementary School children. They hope to expand their project to include Pinewood Elementary. Plan to attend this important and interesting meeting. In addition, I plan to provide a little information on the new health facility currently being constructed at the corner of US1 and Truman Scarborough Way. Oops -- sorry about the wrong date it should be April 17 – that's the 3rd Tuesday. The next meeting of the Mims Community Group will be on April 17, 2018 at 6:00pm at the Moore Cultural Complex (2180 Freedom Ave., Mims, FL.). Our speaker for this meeting will be Brevard County District 1 Commissioner Rita Pritchett. She will discuss areas of interest to our group, including the Trail, possible road paving, fixing the Indian River Lagoon, possible septic tank restrictions, and other current topics being discussed by the County Commission. Plan to attend this important and interesting meeting. March 14, 2018 The next meeting of the Mims Community Group will be on March 20, 2018 at 6:00pm at the Moore Cultural Complex (2180 Freedom Ave., Mims, FL.). Our speaker for this meeting will be Lois Harris with the Native Plant Society. She will speak about plants native to our central Florida area, the benefits of using native plants, where might these plants be purchased, and other suggestions for having a yard that doesn't require as much fertilizer and water as needed by traditional yards. Plan to attend this important and interesting meeting. The next meeting of the Mims Community Group will be on February 20, 2018 at 6:00pm at the Moore Cultural Complex (2180 Freedom Ave., Mims, FL.). Our speaker for this meeting will be Sarah Kraum from Brevard County's Transportation Planning Office. Sarah will speak about the Trails in north Brevard county. She will discuss the East Central Regional Rail Trail in Brevard County, which has just been completed and turned over to Brevard County for routine maintenance. Additionally, she will tell us about the new Trail that is planned to go east from Titusville through the Merritt Island National Wildlife Refuge and the Canaveral National Seashore. Plan to attend this important and interesting meeting. The next meeting of the Mims Community Group will be on January 16, 2018 at 6:00pm at the Moore Cultural Complex (2180 Freedom Ave., Mims, FL.). Our speaker for this meeting will be Mike Knight, Program Manager for the Environmentally Endangered Lands Program in Brevard County. Mike will speak about the EEL property in north Brevard county, what activities are allowed, and future plans, including possible tie-ins with the East Central Rail Trail. Plan to attend this important and interesting meeting. 12/29/2017 — Last day existing library building is open to the public. 1/2/2018 — Sorenson Moving Company, under supervision of Library staff, begins removal of building contents. IT staff remove computers & equipment. 1/8 or 1/9/2018 — After building emptied, power to be cut by FPL. 1/10/2018 — Canaveral Construction to begin demolition process. This important and interesting meeting is timely, since the holidays and the time after a hurricane are busy times for crooks and thieves. The next meeting of the Mims Community Group will be on October 17, 2017 at 6:00pm at the Moore Cultural Complex (2180 Freedom Ave., Mims, FL.). Our speaker for this meeting will be Joe Walter, agricultural agent from the Brevard County Agricultural Extension Office. He will talk to us about raising chickens in our backyards. He will discuss the benefits of raising our own chickens. Also, he will discuss things that we should be concerned about and provide do's and don'ts about this endeavor. This interesting and informative program will be helpful whether it is you who is raising chickens or it is one of your neighbors. Since Governor Scott has declared an emergency for Florida due to hurricane Irma, the September meeting of the Mims Community Group is cancelled. The next meeting of the Mims Community Group will be on August 15, 2017 at 6:00pm at the Moore Cultural Complex (2180 Freedom Ave., Mims, FL.). Our speaker for this meeting will be Matt Culver, from Brevard County Natural Resources Department. He will update us on the clean up of the Indian River Lagoon and dredging in North Brevard. Come hear this useful and informative program. Thank you to all who attended last night's interesting and informative meeting of the Mims Community Group. Cindy Flachmeier, CEO of Aging Matters In Brevard, spoke to us about their Seniors Assistance Housing Improvement Program. This program is for seniors 60 years of age or older who own their own home. Cindy encouraged all seniors to prepare our houses now before an accident happens rather than later. She also said that Aging Matters can provide a walk-through service to point out potential improvements that you might want to consider. The Seniors Assistance Housing Improvement Program has skilled handymen who provide assistance with minor home repairs or environmental modifications to help improve home accessibility and ensure the safety and security of elder home owners. All handymen are skilled professionals who are background checked and covered by workers' compensation insurance. FOR MORE INFORMATION, CALL (321) 631-2744. Services are provided at no cost; however, donations are encouraged. The next meeting of the Mims Community Group will be August 15, 2017, 6:00pm. Thanks to Luis Hernandez from Brevard County Emergency Management Office for providing the Emergency Preparation Guide at our meeting and explaining how we could be better prepared for a hurricane. According to the National Hurricane Center (NHC), along the coast, storm surge is often the greatest threat to life and property from a hurricane. In the past, large death tolls have resulted from the rise of the ocean associated with many of the major hurricanes that have made landfall. Hurricane Katrina (2005) is a prime example of the damage and devastation that can be caused by surge. At least 1500 persons lost their lives during Katrina and many of those deaths occurred directly, or indirectly, as a result of storm surge. Based on my viewing of several TV channels reporting on tropical storm Cindy this week, the storm surge information is not being mentioned. I was able to find that TS Cindy would have a storm surge of 1-3 feet only by reading various reports on the Internet. Beginning in 2014 the NHC changed its hurricane category system to use only wind speed. Research had shown that storm surge was not directly proportional to wind speed. Storm Surge warnings would be identified separately. Currently, storm surge information is given as feet of storm surge. This means individuals must know the elevation of their property to determine if they are at risk. Locate your property by entering you name in the Property Search box, then expand the view until you can find your property. Next, under the Layer option, turn on Topography to view the elevation. You may want to turn off Zoning, FLU, and Parcels to make it easier to see the elevation numbers. According to the National Hurricane Center, if 2008's Hurricane Ike had made landfall in Palm Beach, Florida, the resulting storm surge would have been only 8', rather than the 20' that occurred where Ike actually made landfall on the upper Texas coast. These greatly differing surge impacts arise from differences in the local bathymetry (the shallow Gulf waters off of Texas enhance storm surge while the deep ocean depths off of southeastern Florida inhibit surge). Prior to 2014, it was assumed that the storm surge created by a hurricane was directly proportional to the wind speed. There are maps available that show for Brevard county, how far a particular strength of hurricane would push water inland. To view these older maps that show Storm Tide Zones based on the Hurricane category, click on the link below. These maps are still useful in that they give property owners a general idea of their storm surge risk. Note: I will bring a print copy of these maps for north Brevard to the next Mims Community Group meeting. 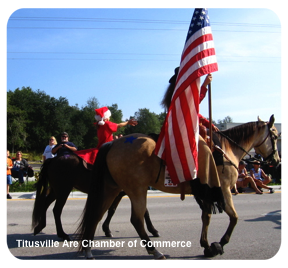 6:00pm - 9:00pm - Red, White & Pie Downtown Titusville Street Party. Featuring our annual Pie Eating Contest: City vs.Nissan - Sheriffs vs. Teachers Street Vendors, Classic Cars, Shops open late. 5:00 - 8:30pm -- Welcome Center (Julia St.) Parking Lot. The tentative date for closing the Mims/Scottsmoor Library in preparation for a permanent building is the end of July. Reminder: the next MCG Meeting will be July 18,2017. See you there. The next meeting of the Mims Community Group will be on June 20, 2017 at 6:00pm at the Moore Cultural Complex (2180 Freedom Ave., Mims, FL.). The speaker will be Luis Hernandez from Brevard County Emergency Management Center. He will speak about preparing for this year's hurricanes and what changes are being made to the forecasts that we receive; especially, the storm surge information. May 2, 2017 Mark your Calendar. There will be no meeting of the Mims Community Group for the month May. Instead, I invite everyone to attend a Florida Department of Transportation public information meeting regarding the resurfacing and drainage improvement plans for SR46, from US1 west to Palm Avenue. I believe this informational meeting will be worthwhile, since we all care about roads and traffic. This meeting will be held on Thursday, May 18, 2017 at the Indian River Preserve Golf Clubhouse (formerly, the Walkabout Golf Club). The address is 3950 Clubhouse Drive, Mims. The meeting will begin as an open house starting at 5:30pm, followed by a presentation by Florida Department of Transportation at 6:00pm. FDOT personnel will be available to answer questions about the project. From SR46 take Australian Way north (across from McDonald's) or take Folsom Road north to the club house. From US1 take Glenn Road west to Folsom Road, then north to the club house. See you Thursday. On Friday afternoon I met with Mr. Jeffery Greene, who owns the property on which the Transport Truck Center in Mims is planned. He explained that that plan was preliminary, and that he has now updated his plan for that property. His original plan called for a Truck Center, parking for large vehicles (trucks, trailers, boats, buses, etc. ), and some self-storage units. His revised plan replaces the Truck Center with a set of small office/workshop units that could be leased. He still plans on having parking for large vehicles on the back of the property as well as some self-storage units. This new plan sounds like something we can support. Please let me know what you think. Mr. Greene has agreed to be the speaker at the next meeting of the Mims Community Group, April 18. The next meeting of the Mims Community Group will be on April 18, 2017 at 6:00pm at the Moore Cultural Complex (2180 Freedom Ave., Mims, FL.). The speaker will be Jeffery Greene, President of John Greene Logistics & Greene Transport Companies. 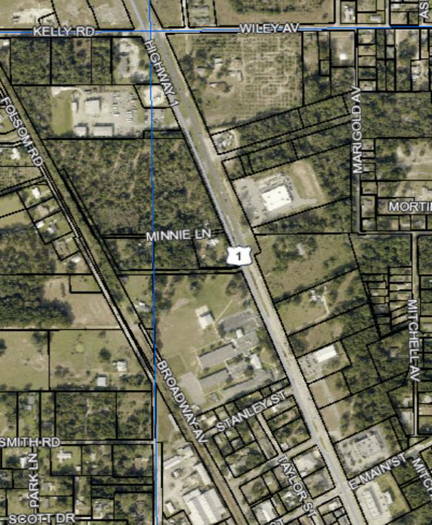 A zoning change is being requested for a piece of property on US1 in Mims to build a transport truck center, some self-storage warehousing units, and parking for approximately 30 commercial vehicles, semi-trucks, tractor trailers and transport trucks. The property is located on the west side of US1 across from the Tractor Supply store. The property is north of Minnie Lane and south of the Fuel Tech property. The zoning request is to change the front 3 acres of the property that fronts US1 from BU1 to BU2. The back portion of the property (approximately 9 acres) is already zoned BU2. Note that the 200' portion of the Fuel Tech property that directly fronts US1 is zoned BU1 and is only used for vehicle parking; the back portion of Fuel Tech's property is zoned BU2 and that is where the fuel processing is performed and where the big trucks are parked. This zoning request is scheduled to appear on the Planning and Zoning Advisory Board's agenda for April 17, 2017. This board meets at 3:00pm in the County Commission chambers in Building C at the government complex in Viera. As President of the Mims Community Group, I am requesting your comments and concerns about this proposed development. 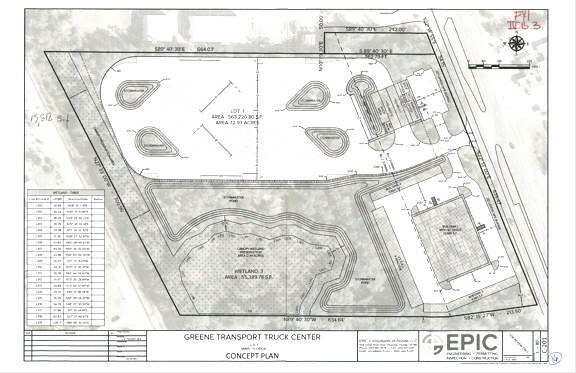 Below are two pictures: 1) the location of the property and 2) the preliminary plan for the Transport Truck Center. We missed many of you at the Mims Community Group meeting. Last evening Jeff Davis gave us a good update on changes to the North Brevard Parks. He also brought some flyers about upcoming events sponsored by North Area Parks Operations. You may have noticed that the Mims water tower has been dismantled. The water tower will not be replaced. It is no longer needed, since the water plant was upgraded several years ago. The water plant has diesel generators in case of a power outage. The next meeting of the Mims Community Group will be on March 21, 2017 at 6:00pm at the Moore Cultural Complex (2180 Freedom Ave., Mims, FL.). The speaker will be Jeff Davis, Brevard County North Area Parks Operation Manager. He will discuss the parks in North Brevard and what changes have been made to them recently. The next meeting of the Mims Community Group will be on February 21, 2017 at 6:00pm at the Moore Cultural Complex (2180 Freedom Ave., Mims, FL.). The speaker will be Mike Knight, Brevard County Environmentally Endangered Lands Program Manager. He will discuss the Environmentally Endangered Lands Program and how these lands might add to Rails-to-Trails. The next meeting of the Mims Community Group will be on January 17, 2017 at 6:00pm at the Moore Cultural Complex (2180 Freedom Ave., Mims, FL.). The speaker will be Mark Crosley, Executive Director of Florida Inland Navigation District. He will discuss the use of a 101 acre site in North Brevard (SW corner of Cuyler Street and Hammock Road) for use in dredging the Intracoastal Waterway.